Kathy at the Backyard Bird Nerd took a whole bunch of shots of the rose-breasted grosbeak that I’ve been working on most of the week, and you may be tired of me mentioning them by now, but since tonight’s artwork looks like Plan E or F, then Sunday’s artwork it is. You’ve already seen the guy in the upper left. He’s the only one I stopped to do a bit of a step-by-step demonstration of, and I posted that earlier this week. Clockwise from left: Polychromos colored pencil (I think it was burnt carmine), Micron 005 pen (that’s the finest tip there is, I think), Signo 207 blue ink pen (just a gel ink pen I had in the office), and a Derwent drawing pencil (I ordered one open stock, just to test them out). What surprised me about this is that I think I like the ink ones the best! I guess the black ink one is my favorite. Ink is very zen; I think I could get into it if I gave myself the time and space to do it. I can’t help but be on pins and needles for a good while as I begin a drawing though, as that little voice inside my head keeps telling me “One wrong move and you’re dead!” Oh, the unforgiving nature of an ink pen. Although BB at bbs art and design recently told me that a kneaded eraser can actually be used on ink, not to fully erase, but to dull the lines down a good bit. This really opened my eyes to the possibilities of the medium, for me. Thanks, BB, and thanks to all of my friends here who I learn from every day. I appreciate all of you much more than you know. Lots of life in these. The ink is my favorite too. Thanks! Ok, that was my favorite pitcher your Mets stomped on last night, lol! I think they’re for real. I hope they make you proud this year. I believe we play two more games at Camden in August. Yes I think you’re right about games in August. As to the “for real”…the Mets are famous for winning almost no games after the All Star break, no matter how well they are doing before. So until then, I’m still skeptical. These have worked really well – lovely! Thanks, Rebecca! I appreciate you saying so! I wouldn’t mind recommendations on all but only when you have time no rush. After looking at your birds I’m nervous about my pathetic bird post for tomorrow. LOL. But we’re going with it and remembering that it’s a first attempt! Have a great day my friend. No worries – busy day ahead for me too! 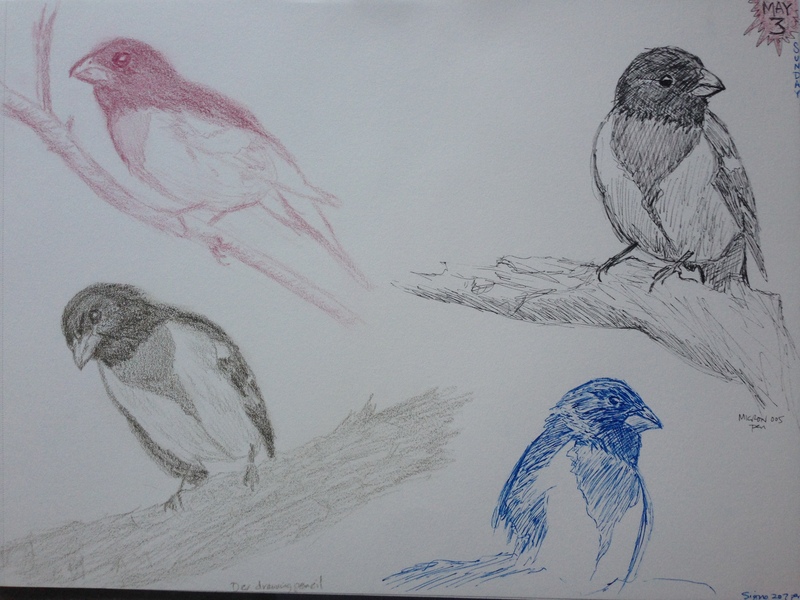 Hi Laura – great sketches… Looking forward to seeing you beautiful bird tomorrow. All your practice is making a difference. Thank you so much, Sharon, but I’ve not even started on it, or even chosen a subject! Eek!!!! The pressure lol! Thank you again for your kind remark. Lol, sometimes under pressure we do our best work … Have fun! You’re so welcome, Jill! The great benefit for me here was I could bring up one blog post and draw all of those different poses from the photos shown. I’m finding it really valuable to approach the exact same bird from so many different angles! I’m a lazy artist, lol, and having one post for every sketch I wanted to do was a big plus for me. Thanks for your vote; I think that one is my favorite too (can’t remember if I put that in my post, lol, oh I need those Alzheimer’s drugs). I’ve been standing here looking at them to pick my favourite one… and it has taken me quite a while …. I still can’t decide. They are all so lovely- great work. Awww. Thank you so much; what a nice comment. I really appreciate that. Thanks Jennifer! I do love them. Neat collection of bird drawings. Thank you so much! This was a fun page to do!